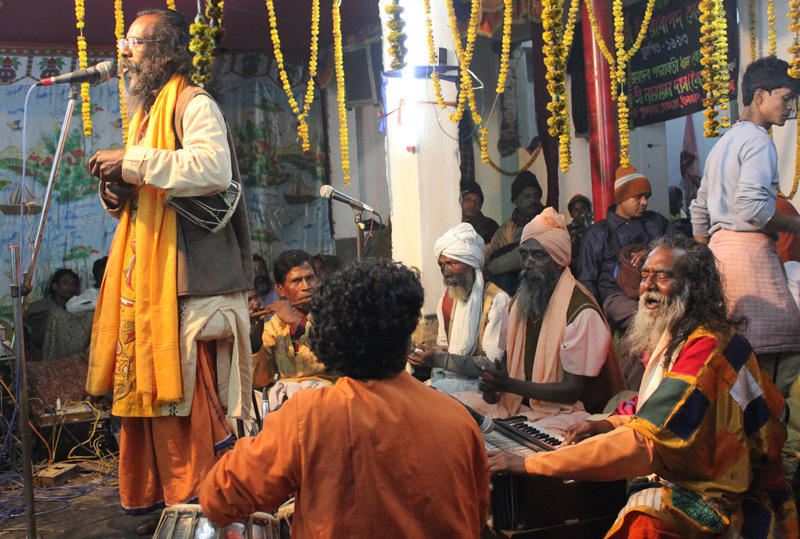 Every winter, in the heart of Lal Mati’r Desh (Red Soil Country) in West Bengal’s Birbhum district, the vibrant community of Bauls (wandering minstrels) converge to warm the air with soulful music. Set on the banks of the Ajoy River, 42 km from Shantiniketan, Kenduli’s Joydeb Mela is a 3-day annual festival held during Makar Sankranti between Jan 14-16. 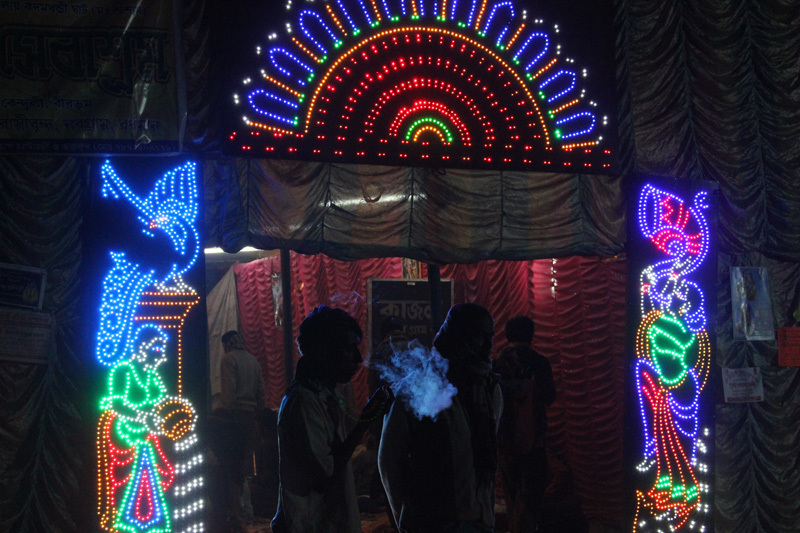 If songs of love and freedom, poor sanitation and three days of camping defined Woodstock; Joydeb Mela is Bengal’s answer to it. The road wove past the twin terracotta temples of Joda Mandir at Bholpur before depositing us in the artistic air of Shantiniketan, Rabindranath Tagore’s renowned university campus. An unplanned excursion took us to Prantik, a Santhal village nearby where a tribal sculptor moulded clay figurines. Soon, we were squatting in a traditional home, our faces buried deep inside large black-metal bowls of hadiya (local rice beer), swaying to low beats of tribal drums. Snug in the warm hospitality of Kalomoni and Karthik’s family, the impromptu jam was the perfect aperitif for the night. We crossed Illambazaar, halting briefly at the Raghunath and Lakshmi Janardhan temples at Ghurisha to join the dots of our terracotta temple trail to Kenduli. The village road was a crawling millipede on wheels. 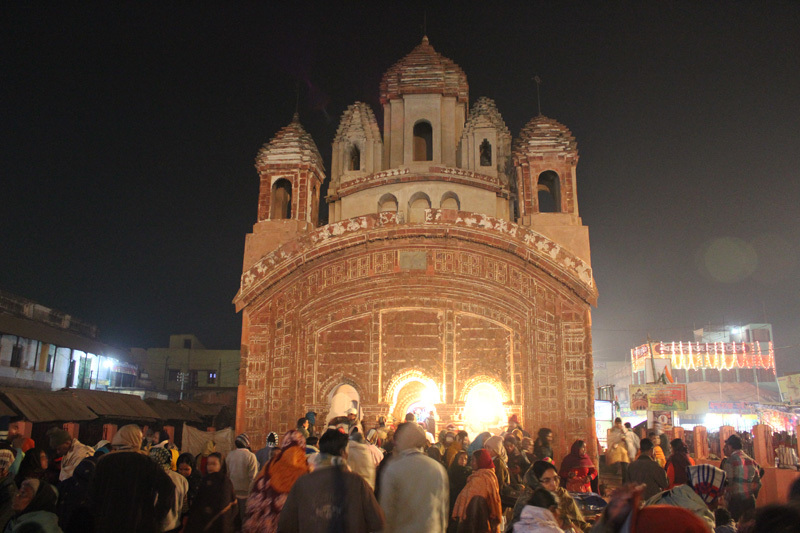 Every vehicle – cycle, bullock cart, van, bus, truck or taxi bulged with people inching towards the fair grounds. Beyond a chaotic parking lot, a river of heads flowed into the horizon where clusters of lights drew ghostly outlines of poles, colourful tents, stalls and ferris wheels. The place was abuzz with hawkers, megaphone announcements and a cacophony of music and theatrical discourses. Excited squeals signalled merry-go-rounds, tumble boxes and daredevilry in Maut ka Kuan (Well of Death). Roadside stalls stocked a bizarre collection of commodities – utensils, clothes, dolls, idols, stoneware, knives, ploughs, jewellery, flutes, gas cylinders and electronic goods! Food stalls served snacks and some akhras (religious shelter) offered khichri-alu dum and garam-bhat as prasad. Past the assault course of commerce was the portal of spiritual bliss. 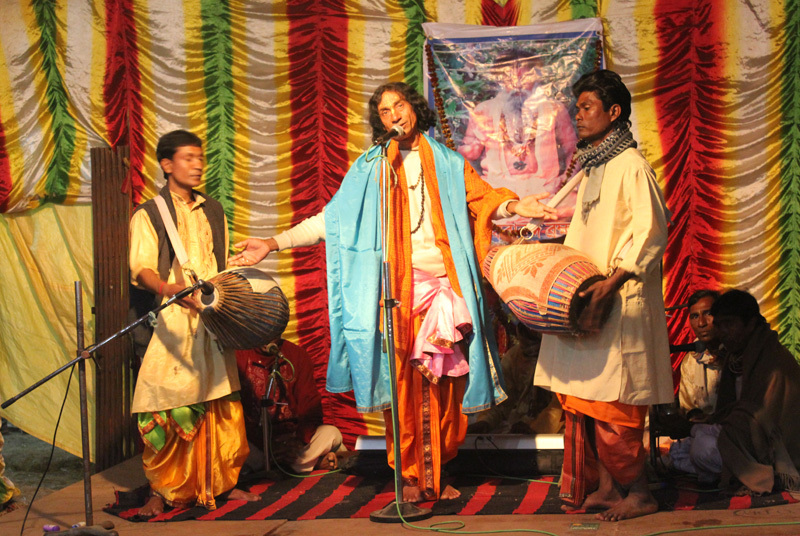 The music and poetry of the legendary Lalon Fakir, founding father of Baul philosophy and gurus like Haure Goshai, Podo, Jadubindu and Panju Shah resonated from tents and akhras. Inside, the audience went into raptures as the voices soared. Like rustic hippies who sing of only love and peace, groups of long-haired Bauls, sages, mendicants and travellers huddled around a campfire in the shared communion of a peace-pipe. 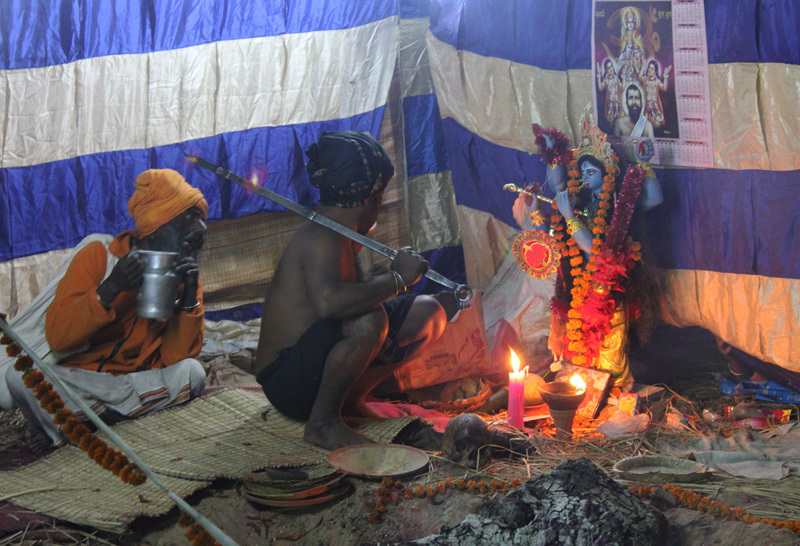 In another tent, a tantric was in the throes of Kali worship with a skull, staff and trident. For Bauls, bhakti (devotion) is the only religion. Their open philosophy, unconventional life and music fuses tenets of Vaishnava, Shakti, Sufi, Tantra, Siddha and Buddhist beliefs allowing them to be neither bound nor defined by religion. Draped in saffron or multi-coloured robes, they strum the ektara, thrum the bama or duggi (clay drum) and swirl like dreadlocked dervishes with anklets wrapped around their feet. Shunning all trappings of worldly life, Bauls sing about man’s relationship with God, spiritual liberation and the pursuit of the divine. The Sanskrit root vatul (batul in Bengali) means mad. We joined a rabble that sat drenched under the beautiful strains of a blind Baul singer playing a harmonium as admirers tucked currency notes into his turban. The toughest decision was choosing where to go, so we wandered all night in Baulesque fashion from tent to tent. Sadhan Bairagya’s ashram Moner Manush was a big draw. Heaps of cramped weary bodies curled up in dark corners. Elsewhere, kirtaniyas lured us with their eyes, story-tellers got dramatic and dancers in mythological ballets spun vigourously. 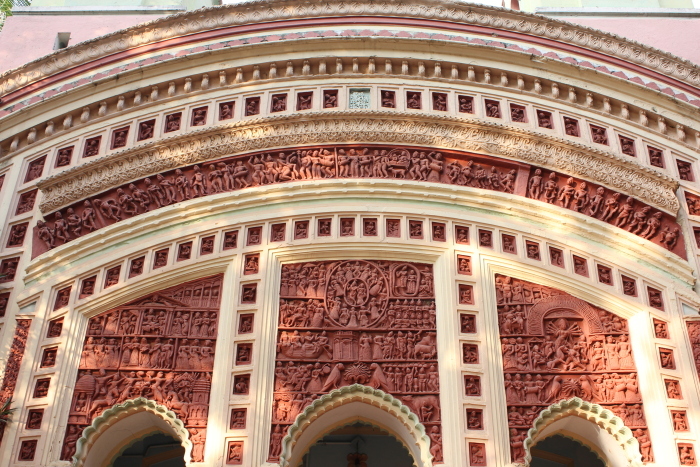 Streams of visitors wended their way into the magnificent shrine of Radhabinod replete with intricate terracotta panels. Across the levee, the Ajoy river flowed placidly as devotees bathed in it and boats ferried pilgrims. At Kadambokhandi Crematorium, bodies were being consigned to flames. Travellers hunted desperately for scarily basic toilets. Kenduli offered a strange cocktail of life, death, shopping and entertainment against the backdrop of song. 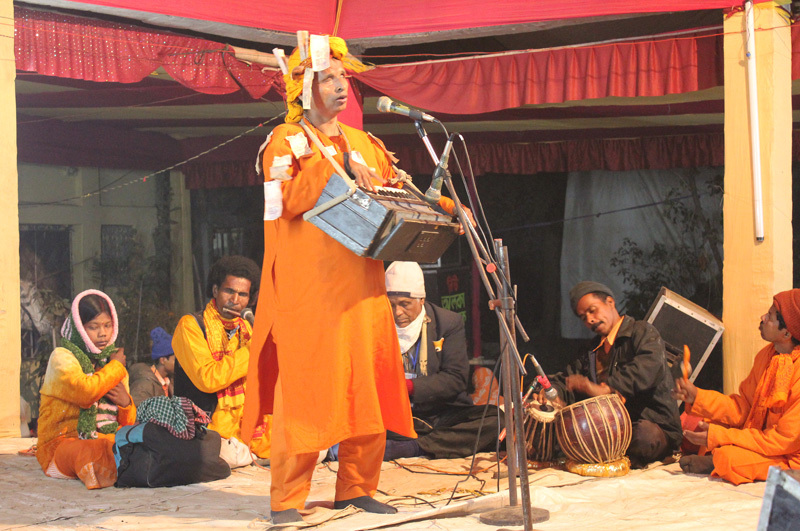 As night embraced dawn, we settled down for more Baul music that has tinged Bengal’s cultural ethos with its own shade of spiritual blues for over five centuries. By Road: Bolpur is 160 km from Kolkata via Bardhaman (52km away) and Guskara. Regular bus service and cabs from Jamboni bus-stand connect Bolpur to Kenduli (35km). Or, continue on Kolkata-Durgapur express past Bardhaman till Darjeeling More and take Rampurhat Highway to reach Illambazar. From Illambazar, drive for 2 km towards Suri and then turn left at Joydev Mor (or after 6 km take left turn from Ghurisha) and drive 12km to go to Joydev- Kenduli. By Train: Bolpur station, 2km from Shantiniketan is the nearest rail head and connected by regular trains from Kolkata (3 hours). Guided Trips: West Bengal Tourism Development Corporation (WBTDC) organizes package tours to Kenduli from Shantiniketan. There is also a weekly haat (rural market) in Joydev. Stay: Accommodation and sanitation at the fairgrounds is extremely basic and people often camp around, though it is not recommended. One can rough it out in ashrams or rooms rented out by villagers. Barring the tedious to and fro travel, Bolpur is an ideal base. WBTDC has a tourist lodge in Shantiniketan besides Mitali Homestays at Phuldanga and Chutti Resort at Bolpur. Authors: Anurag Mallick & Priya Ganapathy. This article appeared in the January 2014 issue of National Geographic Traveller.